Aluminium oxide and hydroxide are raw materials for the production of a large number of aluminium products that are required worldwide. These materials are produced from bauxite, a reddish sedimentary rock mined mainly in Australia, China and South America. From there it is transported by sea to Aluminiumoxid Stade GmbH (AOS), one of the largest aluminium oxide producers in Germany. The company processes around two million tons of bauxite annually, from which around one million tons of alumina can be extracted. Since the previously used energy supply systems were very maintenance-intensive and always caused problems, Fabian Wilhelm decided to use an energy chain system from igus for the first time in 2012. “At that time, Mr. Böhm from igus® introduced me to the principle of energy chains,” he explains. “At first I was skeptical about using energy chains in our demanding environment. 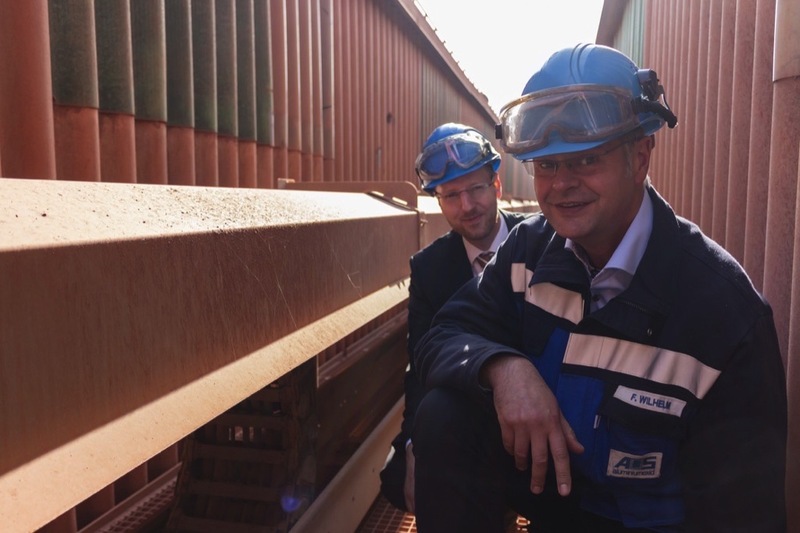 However, after looking at a seaport and an aerated concrete plant as reference applications and having the opportunity to talk to other customers and users, we decided in favour of igus.” As with AOS, the visited references were all applications with travels over 100 metres, or applications in coarse dust and dirt. In particular, the stress of the abrasive salt dust in the seaport on the systems is very high. The first joint project between AOS and igus was the so-called “conveyor belt tripper”. 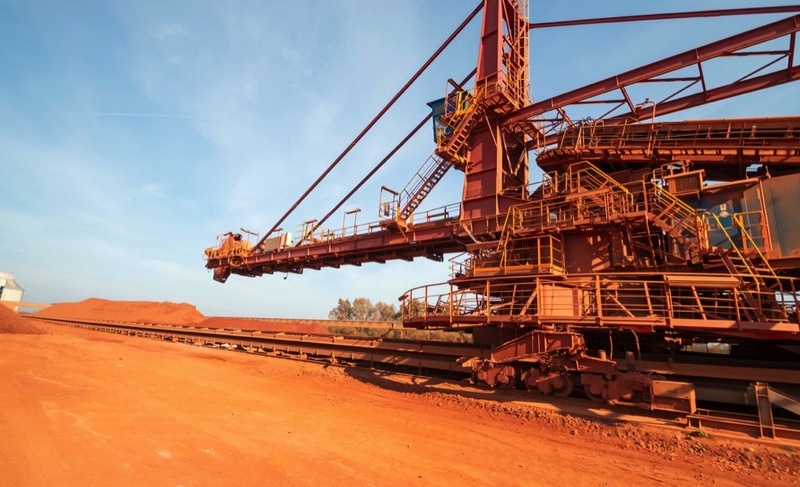 If the bauxite is very dusty, it is not stored in a pile outside, but in a large storage hall, in order to reduce the amount of dust released into the environment. 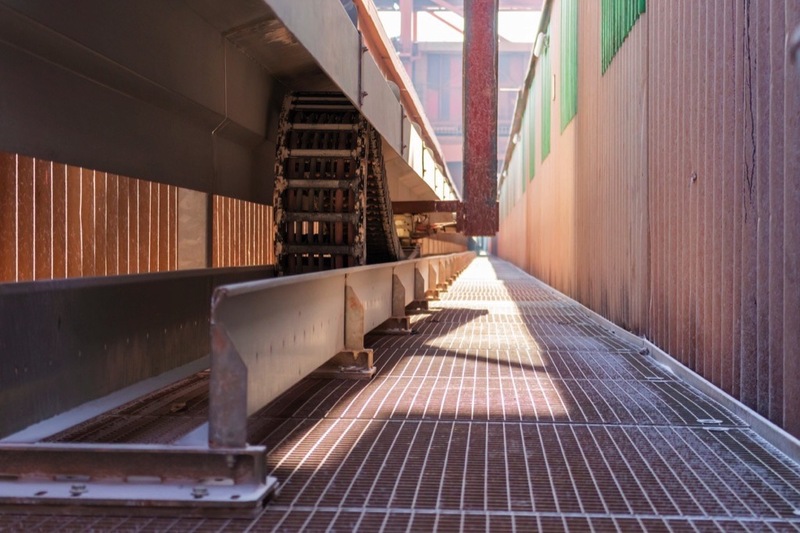 In this storage hall, the belt tripper car moves along an overhead belt conveyor mounted below the roof of the hall over a distance of almost 140 metres to various points where the bauxite is discharged. In summer, temperatures of up to 60°C prevail in the warehouse, but in winter the ambient conditions are even more difficult. 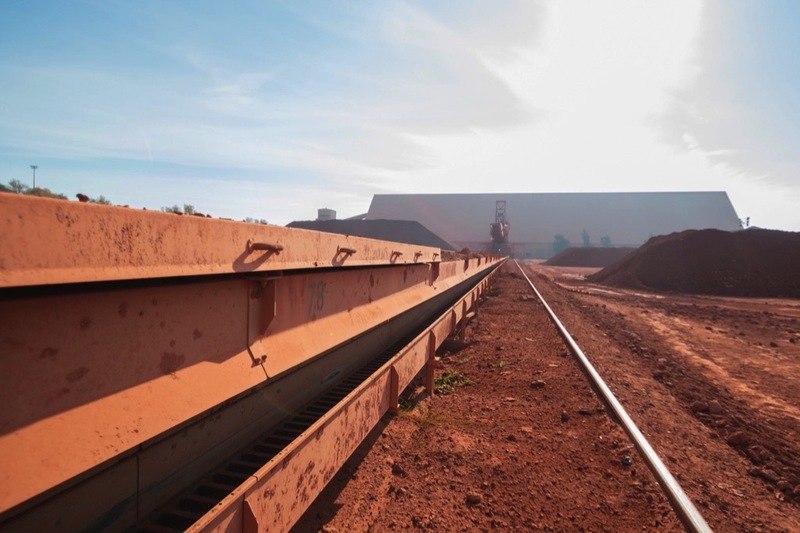 “If warmer bauxite falls on the storage area from a height of 20 meters, the temperature difference leads to condensation,” reports Fabian Wilhelm. “Later on, the condensed water warms up again, evaporates and condenses on the roof of the hall. As a result, it begins to rain in the hall. 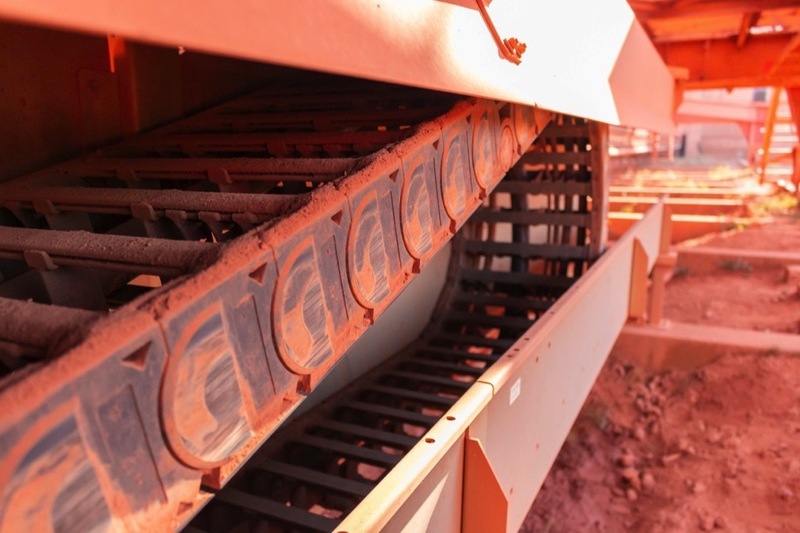 The moisture in combination with the bauxite dust leads to a tenacious, tough material that sticks everywhere and also influences the area of energy supply”. Here the igus energy chain system offers a further advantage, since all applications at AOS also have an integrated electronic pressure/tensile force monitoring. 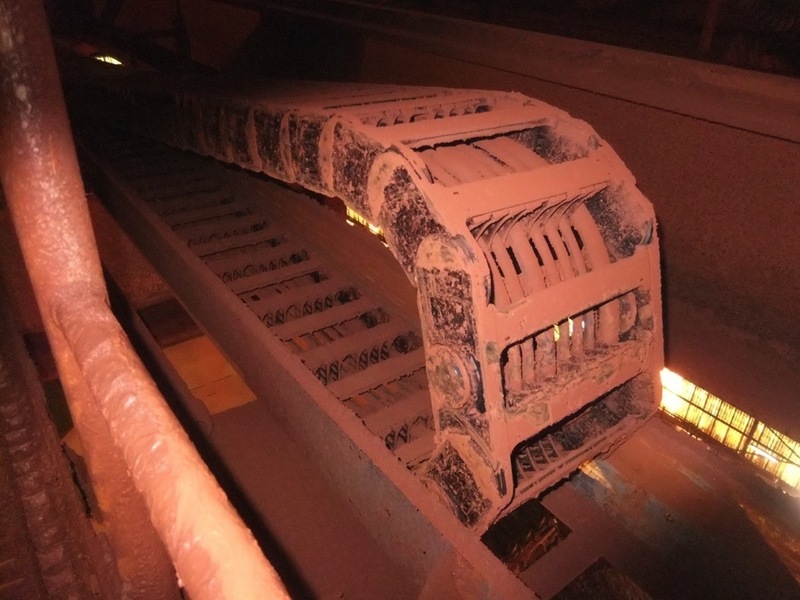 “If the movement of the chain is obstructed by too much dust and dirt, the push/pull monitoring system stops the machine before any damage occurs,” explains Fabian Wilhelm. “The fact that igus was the only supplier to offer such an electronic monitoring system was one of the main reasons for choosing the igus solution. Now, if the monitoring system switches stops the machine, we know that it is time to clean the chain again. After cleaning, the system runs again without any problems.” The capability of the igus chain to handle not only data and energy but also compressed air was another plus. The stacker is now supplied via the longest e-chain® used by AOS. A roller energy chain of type 5050RHDAX moves over a distance of 330 meters. “Due to rollers in the chain links, the tensile and compressive forces drop considerably over long travels when the upper strand of the chain lies on the lower strand,” explains Markus Böhm from igus. “Thanks to the lower friction coefficients, up to 57 percent of the energy required to drive the energy chain system can be saved”. The abbreviation “AX” in the product name indicates the use of “external stop-dogs”. Since the stops are not located between the chain links as usual, the dust cannot penetrate the stops as easily, which can influence the bending radius of the chain and lead to failures. In addition to various energy and data cables, which are also produced by igus and which were specially developed for use in e-chains, the chain of the stacking equipment also contains a water hose of 48 mm diameter. This water is used for sprinkling the bauxite. Furthermore, as with the other applications, a floating moving end ensures lateral tolerance compensation and ensures undisturbed movement. This is particularly necessary for long travels in order to save drive energy on the one hand and to compensate for possible misalignments between the guide rail and guide trough on the other. The most recent joint project by AOS and igus involves two energy chains with a travel of 218 metres running in opposite directions in the same trough. They supply the two cranes that deliver the bauxite and then transport the produced alumina away again. Among others, medium-voltage motor cables from the chainflex® CFCRANE series and fibre optic cables from the chainflex CFLG series are routed here. “This is a real advantage for us,” Fabian Wilhelm affirms. “In the past, in the event of crane breakdowns or maintenance work, we always had to climb 40 metres onto the crane first in order to read the data with a laptop. Today, thanks to the fibre-optic cable connection, this is done directly from the office desk, which clearly reduces maintenance efforts”.